Yellowstone Park Superintendent Dan Wenk on the front step of the superintendent's residence in Yellowstone. In June, Superintendent Dan Wenk told Yellowstone Public Radio he felt abused by the Interior Department. He walked that sentiment back at the press conference. "I regret the use of the word ‘abused’," Wenk says. "I’m just going to tell you that." Wenk says Interior insists he was not forced out of his job. 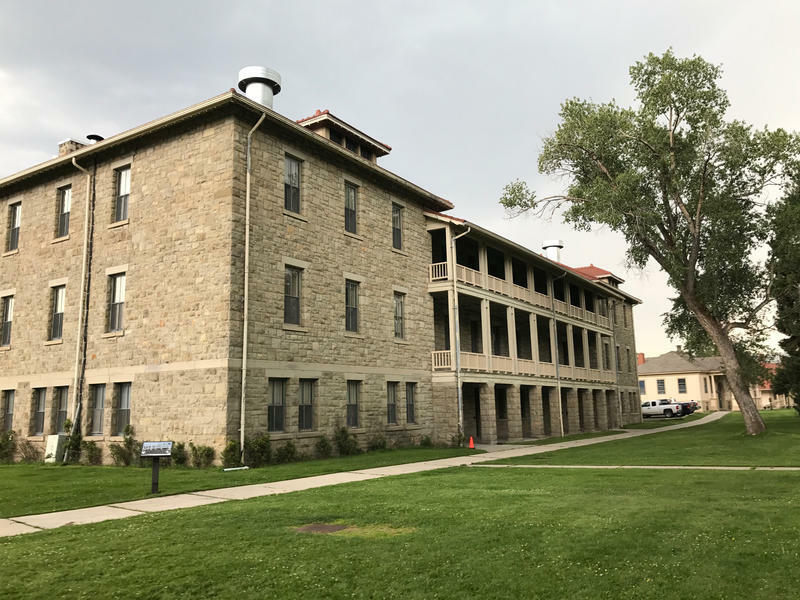 But, he says orders to transfer him to Washington D.C., instead of allowing him to retire as Yellowstone’s superintendent next year, as he’d originally planned, still don’t sit well. "I probably would tell you it still feels a little punitive," Wenk says. "Having it feel punitive and it being punitive are two different things. It certainly felt punitive." Wenk will officially retire from Yellowstone September 29. He covered several topics during the wide-ranging, nearly two hour news conference. Wenk says bison management is Yellowstone’s most complex issue. He says it was also the only issue that caused friction between himself and Interior Secretary Ryan Zinke. "We think the habitat is sufficient to withstand the numbers in the 4,200 to 4,500 range," Wenk says. "The Secretary, understandably, his position would start at, ‘You have a target population in the Interagency Bison Management Plan that talks about 3,000 to 3,500 animals." Wenk hopes to complete the final agreement necessary to launch a new bison quarantine program before he leaves. That would allow the transfer of disease-free bison to the Fort Peck Reservation, with the ultimate goal being creation of new bison herds around the nation. Wenk says Yellowstone is at a crossroads when it comes to visitation, which has increased by almost 40 percent since 2008. He doesn’t believe that’s sustainable and says, "We’re trying to understand the impact of that visitor use in Yellowstone on resource protection. We the National Park Service, certainly my successor, I think are going to have to grapple with that at a much higher level in terms of managing visitation." Wenk’s replacement will be Cameron “Cam” Sholly, currently the National Park Service’s Midwest Regional Director. BILLINGS, Mont. (AP) — Democrats in Congress are asking U.S. Interior Secretary Ryan Zinke to explain the reassignments of dozens of senior agency officials, most recently Yellowstone National Park's superintendent who was offered an unwanted transfer and then told he'd be gone in August. Yellowstone National Park is taking action against up to a dozen employees after an investigation found some female workers were subjected to sexual harassment and other problems. Superintendent Dan Wenk says some of the employees could be fired while others could receive suspensions or counseling. The Montana Department of Livestock is moving forward with a plan to more than double the number of counties that require vaccinating cattle against brucellosis. Montana Stockgrowers Association spokesperson Kori Anderson says, "The only concern we have as an organization is the financial implications that could go along with this expansion." Perhaps you’ve seen this now-viral video of a man harassing a bison this week in Yellowstone National Park. That man, Raymond Reinke of Pendleton, Oregon, was arrested Thursday in Glacier National Park. The 55-year-old Reinke visited several national parks this week. None of those stops went very well. The National Bison Range near Charlo has a way of anchoring itself in local’s sense of where they come from and who they are now. Dave Stipe remembers as a kid taking visitors out to the range to see the herd. "We grew up in our hot lunches eating the buffalo, the deer and the elk from the bison range," Stipe says. Now, as a Lake County Commissioner, Stipe is part of a group working alongside the U.S. Fish and Wildlife Service to outline how the Range and a few nearby wildlife refuges will be managed in the future.